I still have a lot on my new Asian films list. I'll go through them one by one and I'm starting off with Stephen Chow's CJ7. A poor father is heartbroken after he fails to buy his son a toy. Desperate, he pics up what seems to be a cute stuffed toy from the junkyard. Little did he know that the dirty little toy is from outer space and he is about to change their lives forever. If I am to bottle a this movie in a simple sentence, I'd say it's about the unexpected sources of love. In the tradition of E.T., CJ7 expounds on just how creatures who seem so different actually just want one common thing, friendship. 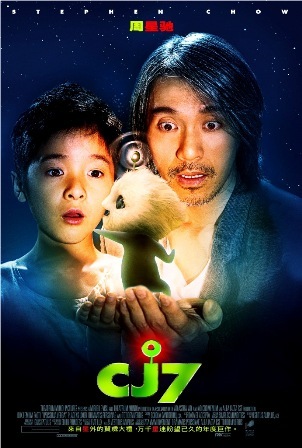 Dropped from outer space, CJ7 luckily finds a kid and a father who had enough "insanity" to believe in what he presents himself to be, a cute and innocent alien with extraordinarily cute powers. To a certain extent, CJ7 is the one that is more human of three main characters. Although endowed with powers, his only use of it is to help and satisfy his human friend. He doesn't even use his power to find a way back home. It's not even clear if he wants to go back home. His only desire is to keep his friend happy. It's a very basic human need and a very basic human behavior. Like CJ7, we all use the resources we have to find a place where we belong. Dicky, the child and son of Chow Ti, is the one who possesses a "superhuman" frame of mind. It is what allows him survive in a school where he is extremely out of place. His situation pushes him to the depths of his imagination. As such, he is motivated to imagine bigger things, impossible things and want greater things. As oppose to CJ7, Dicky wants grander things. He values CJ7 but probably just as much as what CJ7 can give to him. On the other hand, Chow Ti, Dicky's father, sees CJ7 as an object of amusement. It was his free pass from his shortcomings to his son. CJ7, on the other hand, loved him as much as Dicky does. That's the magic of this movie. The cuteness is over the top and it contain the usual brilliant humor of Stephen Chow but the real beauty is in how the characters managed to have different layers and how each layer is unexpected. It may be a full on comedy movie but every laughter it brings comes with a big dose of pure heart. Add this to your new Asian films list.